Homespun Stitchworks..... For the love of vintage: Canterbury Shaker village ..... My lazy Sunday thoughts. 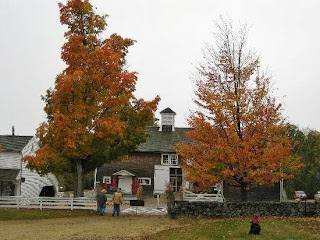 Canterbury Shaker village ..... My lazy Sunday thoughts. 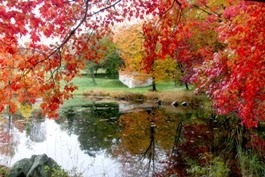 This is in the grounds of the Shaker village in New Hampshire. It is set in 1,084 square miles and is a wonderful place to visit. This is the entrance to Canterbury Shaker Village. have been restored and the rest are in the process of being done. They have set out the buildings as they would have been with actual things that belonged to some of the Shaker people. There is an amazing sewing room which interests me so much. There are pin cushions that bolt on to benches, incredible tools of the trade. There are vintage quilts around the bedrooms and lots of cabinets showing early sewing tools. The 694 acres of forests, fields and gardens are under permanent conservation assessment. There are 25 original Shaker buildings and lots of their machinery and even sleighs for when the snow was bad. Today there is gift shop and lovely restaurant for great homemade soups, pies and bread. You can wander around the buildings and go inside. 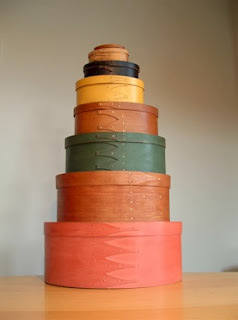 Watch as people make beautiful shaker boxes and brooms and look at the most amazing wardrobes and storage built 100 years ago or more and that we today would love to have. I am lucky enough to be going back to this wonderful place and I love to look at the website for updates on courses there and talks on sewing and cooking and making of wonderful breads and so much more. It's a lovely read for a lazy Sunday. these boxes are so useful Sarah, will think of you when you visit this village, it sounds wonderful and so peaceful.